This website will have information about the Episcopal dioceses in the US and Anglican dioceses in Mexico that touch the Rio Grande. We all have a lot in common and will be exploring it here. Registration will be open until October 15. The cost is $87, not counting rooms or meals. The 2000 miles of border between the United States and Mexico is an area of heightened social, political and spiritual importance. Along the border cultures, economies and families meet and are divided. The border offers the Church a unique opportunity for ministry, and dioceses along the border have each responded in different ways. The Border Ministries Summit will provide participants with the opportunity to share information about what ministries are taking place along the border, both north and south, build partnerships for ministry, and increase awareness of border issues. The six dioceses who share the border will be invited to share their experiences of ministry. Other interested parties are invited to participate as space allows. And here is a link to the PDF file which is easier to read and which you can download. It also has the tentative agenda on the back of the page. Could You Help by Sponsoring the Event? 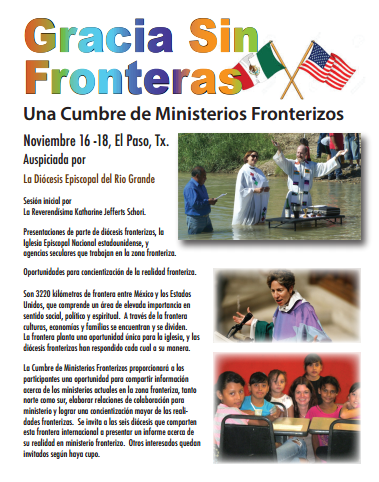 Rio Grande Borderland Ministries of the Diocese of the Rio Grande is offering the opportunity for dioceses and other agencies to sponsor the Border Ministry Summit in November. Luke 10:25-37 tells us the story of the Good Samaritan, who stopped his life long enough to carry a man who life had ground into the dirt to an inn, and pay for his care. In like fashion, this Border Summit seeks to bring people together who are involved on various levels in caring for those who we find ground into the dirt by the realities of our Mexican/American border, carry them to safe places and take care for their well-being. Financial sponsorships are welcome from dioceses, congregations and other entities who would like to support the effort of the Summit. Sponsorships will help assure the financial health of the event, and assist those who might not be able to attend and should, to be there. Good Samaritan: $3000 or more. For every $1000 given in sponsorship at this level, the sponsor will receive one free registration, recognition in the Summit Program, and a gift from one of the ministries that the Diocese of the Rio Grande sponsors along the border. Inn-keeper: $2000 to $3000, two free registrations mention in the Summit Program, and a gift. Inn-keeper’s Assistant: $1000 to $2000, one free registration, mention in the Summit Program, and a gift. Around This Site… Download Any You Want! Border Ministries Mini-Meetings in Santa Fe and Las Cruces in Sept.
Diocese of the Rio Grande Borderlands Ministries Colorful, packed with information! Bilingual Eucharist in the Waters of the Rio Grande, 2018 Delightful!